Remove the front fender protector (RH) front side bolts and clips. Refer to EXT-27, "FENDER PROTECTOR : Exploded View". Hold the hexagonal part (A) of drive belt auto-tensioner (1) with a wrench securely. Then move the wrench handle in the direction of arrow (loosening direction of drive belt auto-tensioner). Avoid placing hand in a location where pinching may occur if the holding tool accidentally comes off. Insert a rod approximately 6 mm (0.24 in) in diameter into the hole (B) of the retaining boss to lock drive belt auto-tensioner. Keep drive belt auto-tensioner pulley arm locked after drive belt is removed. Confirm drive belt is completely set to pulleys. Check for engine oil and engine coolant, be sure they are not adhered to drive belt and each pulley groove. Release drive belt auto-tensioner, and apply tension to drive belt. Confirm tension of drive belt at indicator (notch on fixed side) is within the possible use range. Refer to EM-15, "Exploded View". Install the front fender protector (RH) front side bolts and clips. Refer to EXT-27, "FENDER PROTECTOR : Exploded View". Remove engine under cover. Refer to EXT-31, "ENGINE UNDER COVER : Exploded View". Partially remove fender protector side cover (RH). Refer to EXT-27, "FENDER PROTECTOR : Exploded View". 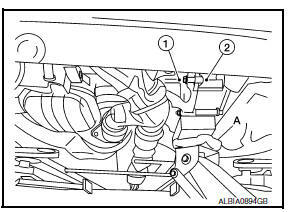 Remove upper torque rod and engine mounting insulator (RH). Refer to EM-82, "M/T : Exploded View" (for M/T) or EM-86, "CVT : Exploded View" (for CVT). 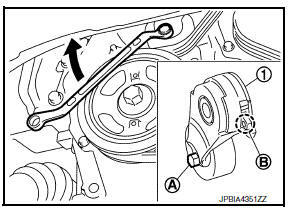 When installing drive belt auto-tensioner, be careful not to interfere with water pump pulley.